I’m Not Writing A Novel has a new look!! It’s nothing fancy, as I’m still totally cheap and using WordPress for free. Still, I think it’s mucho better than it was. 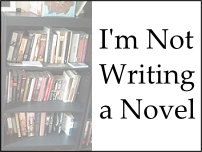 Also, I’m Not Writing A Novel has its own facebook page now. Everybody’s doing it… Jim at Just a Lil Blog, Lance at My Blog Can Beat Up Your Blog, The Robot Mommy (who just celebrated her 1-year blogiversary, can I get a what what! ), and plenty of others. So, if you are so inclined, you can go like the page… I’ve put a handy button over there on the right ————> see it? This new blog design lets me feature posts along the top (as you may have noticed). I’ve stuck some there that I feel are fairly representative of what I’m doing here. However, if you think there’s a different post that should be getting attention, let me know. In other news, M and I are organizing our trip to San Francisco to see beloved friends and family in late April. Let the frantic scheduling of meet-ups begin! You bloggy friends in the Bay Area who are not too shy, feel free to reach out and we can meet up, too! I don’t get out much (to San Francisco, or really, out of my house at all) so I can’t promise I’ll actually be entertaining in person. Just sayin’. Ican promise that I will be wearing clothes. There’s a good chance mascara will be involved. And it’slikely that I won’t be so traumatized from flying with G that I’ll be insane. What more could you want? Well. I kind of liked having that score that means absolutely nothing in the real world but gives me something to obsessively preen about when I should be working! So, here’s to more posting in the future. Don’t panic, I’m NOT going back to every day (at least, not until November). I can’t write all that, and you can’t read it. At the very least, I want to get back to writing at least one meme post a week — as I got busy and stuff, those were the first posts to go. Wish me luck! OK, I guess that wasn’t the last thing, sorry. At some point in the future I’ll be doing a guest post at MommyNaniBooBoo for her 8 Line Challenge in honor of her pubic bone. Please go check her out… there will be other guest posts before mine and I know they’ll be awesome. ← Did I mention Stove Top? I LIKE it! And my liking it has nothing to do with you linking to me, I swear. I have to see if I already liked you on facebook. I mean, liked your page. It’s irritating. I HAD to have a personal page or my page page didn’t work. Now I find myself liking pages on my page, then switching over to my personal profile and liking them again, and I can never remember what I’ve liked and what I haven’t. So did you do it your self? I love the blog changes. Nice picture/glasses. awesome…I’ll go like the page, now. WRITE!